While not a requirement, it is advisable that students interested in enrolling in the Professional Certificate in General Music Studies contact an admissions advisor to help with undergraduate course selection. 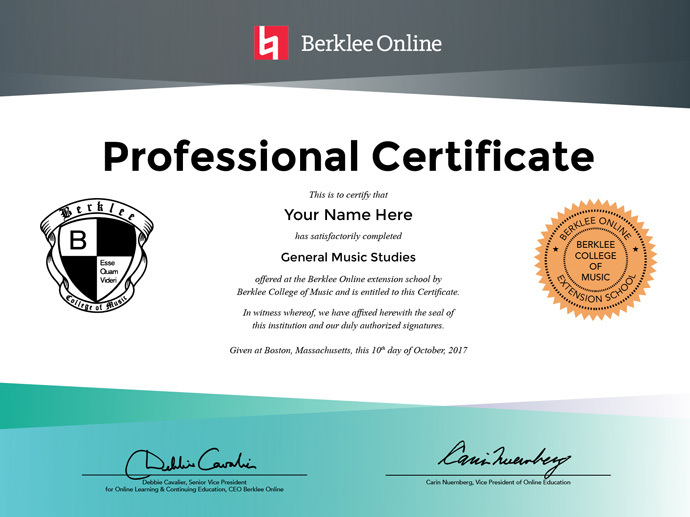 Contact our admissions advisors at 1.866.BERKLEE (U.S.) / 1.617.747.2146 (International), or email advisors@berkleemusic.com. Choose 4 undergraduate courses in any interest area from our course catalog. Contact our academic advisors at 1.866.BERKLEE (U.S.) / 1.617.747.2146 or send an email.